Apple is reportedly denying apps that use "cookie tracking" methods from entering the iOS App Store, suggesting that the company may be making a more aggressive move to have developers use its first-party Advertising Identifier technology. Citing industry sources, TechCrunch claims Apple's App Review team is actively rejecting software from developers that leverage so-called cookie tracking technology, otherwise known as Safari flip-flop or HTML5 first party cookies." The method was instituted as an alternative to unique device identifier (UDID) tracking, which ad servers once used to target specific audiences in generating pricing models. In 2011, privacy concerns prompted Apple to deprecate developer access to UDIDs, leaving advertisers without a direct way to target ads to specific users. At the time, some ad networks claimed apps not using the device-specific data would see a 24 percent decline in revenue. After Apple began blanket rejections of apps using UDID tracking in March 2012, developers turned to secondary tracking methods using MAC addresses and OpenUDID assets. One of the alternatives was browser cookie tracking in mobile Safari. Apple issued its own tool for advertisers, called the Advertising Identifier, though developers tended to stick with the older workarounds as they were attached to a single device and more difficult to disable. iOS 6 introduces the Advertising Identifier, a non-permanent, non-personal device identifier, that advertising networks will use to give you more control over advertisers' ability to use tracking methods. 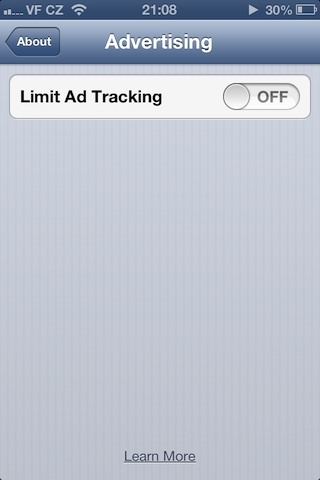 To that end, Apple instituted an opt-out for the tracking tool with the "Limit Ad Tracking" settings button first seen in iOS 6. It is unclear what Apple's intentions are for the recent rejections, though sources say the actions could signal a broader push to the Advertising Identifier method.